Having a fast website is very important. As I mentioned in my Black Friday post, nobody likes a slow website and if your site take more than a few seconds to load, the chances are you are loosing visitors because of that lag. This article contains a few easy to implement tips which you can use to help you reduce the load time of your website. Unless something goes wrong, or someone chooses to view your source code, most of the people who visit your website will never see any of the code that is stuffed away behind the scenes. That doesn’t mean it isn’t important however. After all, the code at the back-end is what creates the website at the front end. It is good practice to fetch as few files as possible when loading your website. For example, many sites use separate style sheets for different parts of the website – for example one for text, one for images and another for general layout. Every file that your page calls upon increases its overall load time. Fetching one big CSS document will usually be faster than fetching three smaller ones. Also consider how many external resources you load – for example adding a Facebook like button will require the users browser to visit Facebook’s website to pull the code across, whilst loading your page. A link or a delayed load on things like social sharing buttons can give you a big speed boost. Images make your content more exciting, however if you don’t optimise them then they can often really slow your page load time down. There are various ways you can reduce the file size of your images without compromising on quality. When you take a picture, it can often be much bigger than you really need it to be. By resizing photos before you upload them, you can massively reduce the file size of your images. If you leave the file big, but resize it using HTML or CSS – by setting a smaller height and width – then the end user still has to load the big image, and then their browser then has to squash it down to fit your new image dimensions. The most commonly used image formats are .jpg, .gif and .png. Different images lend themselves to different formats. Reducing the number of colours available to a GIF or a PNG-8 image will reduce the files size, whilst reducing the image quality will lower the size of a JPEG file. Image compressors are another way to shrink images. Technology Bloggers currently uses a WordPress plugin called WP Smush.it which uses the Yahoo! Smush.it tool to reduce image files. 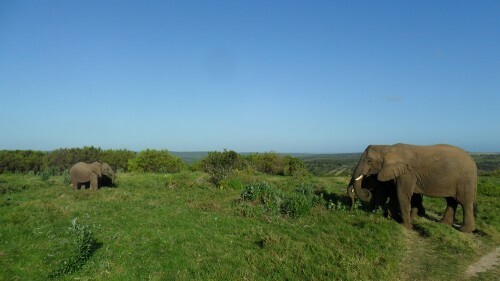 Here is a picture that I took several years ago whilst in South Africa. The full sized image was 3.44 megabytes. Resizing it in Photoshop helped me reduce that to 1.61 megabytes. Because there are lots of colours and the image was quite big, choosing GIF and PNG-8 format made it look too pixelated, so it was between PNG-24 and JPEG. PNG-24 squashed the image down to 831 kilobytes, whilst JPEG compressed it to a tidy 450 kilobytes. Although that is a lot smaller than the original file, it would still take a long time to load on a slow connection so by taking a very small hit on the image quality, I managed to get the file size down to 164 kilobytes. Finally running the image through Smush.it took it down to 157 kilobytes. Some images see a big reduction, most (like this one) see a smaller reduction of just a few percent. Content delivery networks, or CDNs, can help to improve a websites speed and make it more reliable. Put very simply, when someone tries to access your site, without a CDN they are directed to your hosting provider, who will then serve them your website and all its files from their server. This means that if your host goes down because of a fault, or a sudden surge in traffic you loose your site, and also if your host is not close to a user, it can take a long time for them to communicate. With a CDN, users can fetch your site faster, because it is offered in multiple locations around the world. Additionally many CDNs can cache a copy of your site, so if your host goes offline, they can provide a static version of your site to users until it comes back up. For example, Technology Bloggers is currently hosted in Gloucester in the UK. If you access us from Australia, CloudFlare (the CDN we use) will send you to its closest data centre, which could be in Australia, which will then deliver the files you need to see our site. It is faster because your requests don’t have to travel all the way to the UK and nor does the data being sent back to you either. If you use a CMS, then the chances are your content is dynamically delivered upon request. Basically, when the user requests a page, your site creates it and then sends it back. By using some form of caching you can create a static image of your site, so your site doesn’t have to create the content each time a user visits it. There are various plugins you can use to help with this, Technology Bloggers uses CloudFlare’s caching system, as I have found this seems to work better than other WordPress plugins I have tried. Also, using too many plugins, slows your site down, hence why I let the CDN manage it. A users browser also saves files for later, in case they visit your site again. It is possible to determine what files are saved and for how long these files are saved for, by adding caching headers to your .htaccess file you can change these settings. Refreshing your page and timing it with a stopwatch is one way to gauge how quick your site loads. This probably isn’t the best way to do it though! There are various websites which rate your sites speed performance. 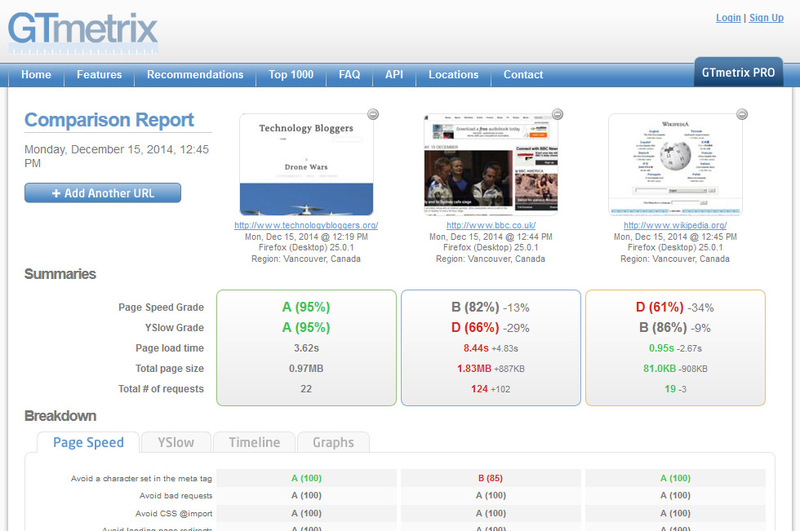 I tend to measure Technology Bloggers using four main speed analysis sites. Google are keen for the web to be faster and offer a very useful tool which gives your site a score for mobile load time and desktop load time. It also suggests what it believes is slowing your site down. Google’s tool also gives an image of your fully loaded site – all the content above the fold. Unfortunately, their test doesn’t actually state how fast your site loads, just how well optimised it is. 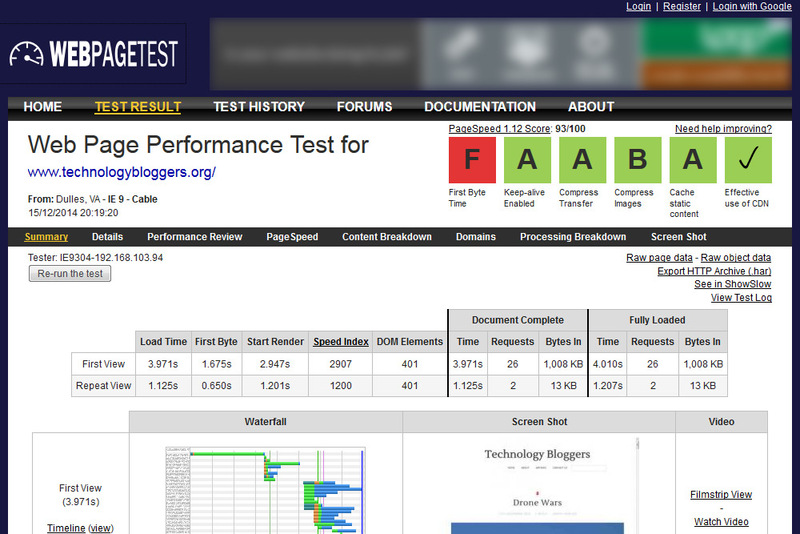 Probably the most thorough site I use is WebPageTest, which presents loads of different information, including first view load time, repeat view load time (which should be quicker if you have user side caching), a waterfall view of all the files loading, a visual representation of how your site loads, suggestions as to where performance issues lie and loads more. Pingdom is another useful tool, it gives a handy speed score and also tells you how fast your site is compared to other sites it has tested. It also saves your speed results, so you can view historic test result speeds on a graph, and see how your sites speed has changed. GTmetrix is another useful site. It also gives lots of details, and helps you to see what is slowing your site down. GTmetrix also lets you compare one site to another, which I’m not really sure is that useful, but it is interesting to see how your competitors site compares to your own. 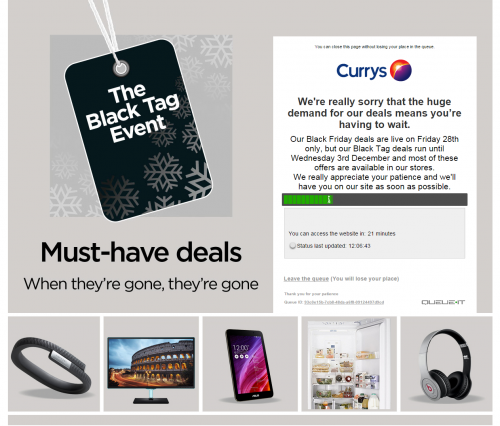 There are various thoughts as to where the term Black Friday originated from, one I recently heard was that it was the date that retailers expected to break even – so move from the red (making a loss) into the black. 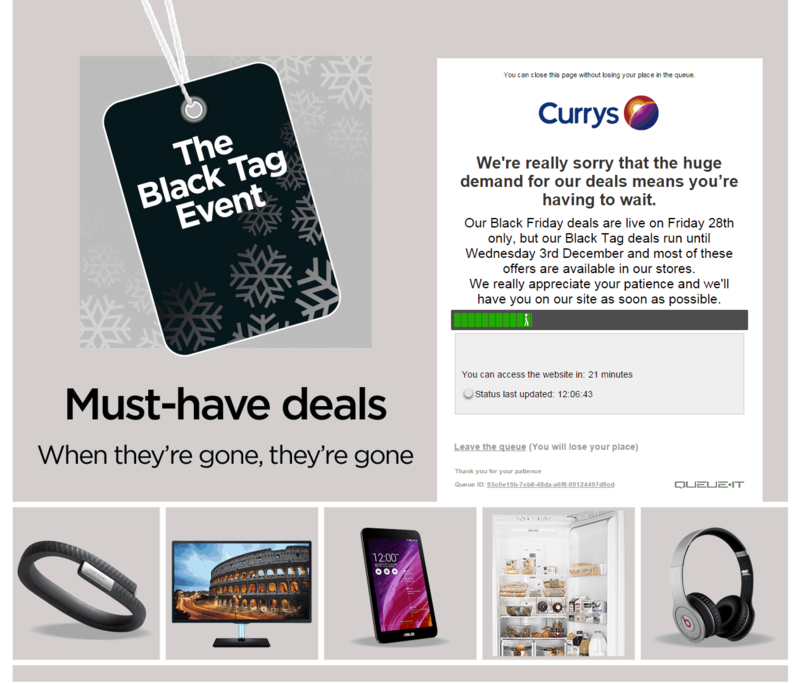 Black Friday is no longer an American phenomena, Australia, Mexico, the UK and many European countries (just to name a few) also now run similar events. In recent times you could argue it is so-called because of the havoc it wreaks. People die in the rushes that Black Friday creates. Some sources state that the day has claimed as many as 100+ lives in the last decade. Many hundreds of people are injured every year in the stampedes and commotion that have become associated with the day. Today the BBC are reporting on a Tesco which has had to close its doors this morning, due to what it calls ‘scuffles’ amongst customers. Whilst physical stores are experiencing high volumes of customers, I suspect their online stores are experiencing many many more. Retailers have known that Black Friday was coming all year, so they are all super prepared aren’t they? It appears not. Many retailers websites have been experiencing higher than normal volumes of traffic today. They expected that though. So why if they were expecting this have many hight profile sites gone down? 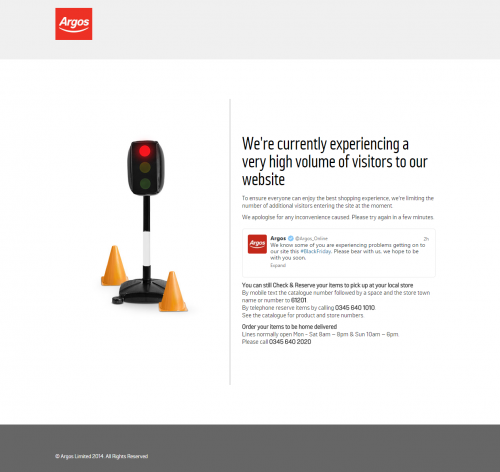 Argos – a previously struggling UK retailer – appears to be turning itself around, yet on what will almost certainly be its websites busiest day of the year, customers have to wait to access their site. I didn’t think they would let this happen, so tried to click through to Argos.co.uk but was greeted with this page. I followed their advice and refreshed the page a few minutes later, and amazingly the site worked! I did try again in a different browser a little later on and I got the same message, however again after a few minutes, it cleared. On any other day of the year, customers would find this completely unacceptable, so why on its busiest day, did Argos let its site get swamped? Argos wasn’t alone though. Currys site was also offline for many visitors. Unlike Argos Currys gave an estimated time that they would let me in. They predicted around 20 minutes when I first joined the queue (yes I joined a queue to enter a website) but by the time I finally got in it had been well over an hour. What I can’t understand is why their sister site, PC World, had no waiting time yet it took me over an hour to get onto the Currys homepage. When I was in everything seemed to load pretty sharpish, so I don’t know why there was such a long wait. Surely more people on a slower connection is better than a handful loading fast? Tesco Direct by far was the worst though. Despite being the second largest retailer in the world (as measured by revenues) the wait to get into the Tesco Direct shop was ridiculous. 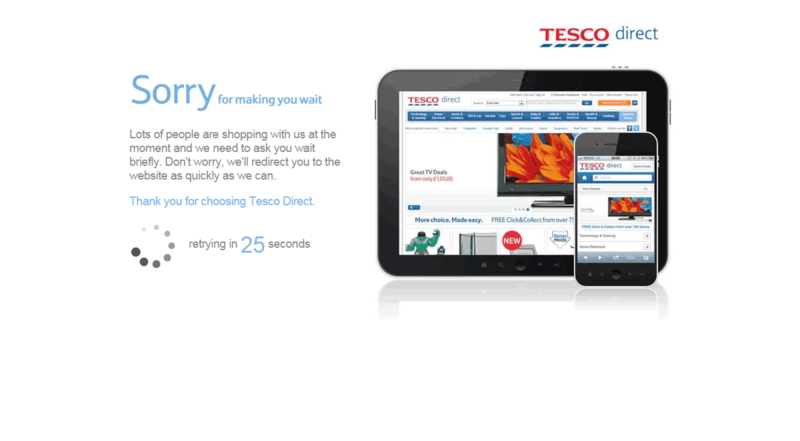 After at least an hour an a half, Tesco’s 30 second refresh countdown timer was still going. Every 30 seconds it was checking if there was space to let me in, and there never was. I don’t know what Tesco were offering – and I suspect many people will never know – because honestly, who is going to wait by their computer for more than 90 minutes to access a website? 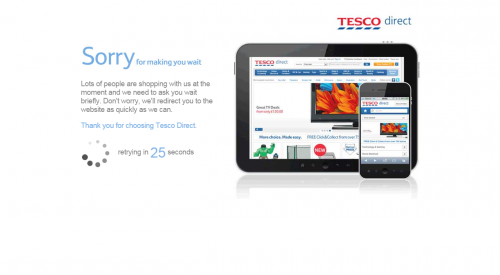 Tesco’s Black Friday Calamity, customers can’t access Tesco Direct for hours. So what lesson does this teach us? Well if you are a big retailer, who is taking part in Black Friday, make sure you invest in the appropriate infrastructure before the day, or else you could miss out on a huge number of potential sales. 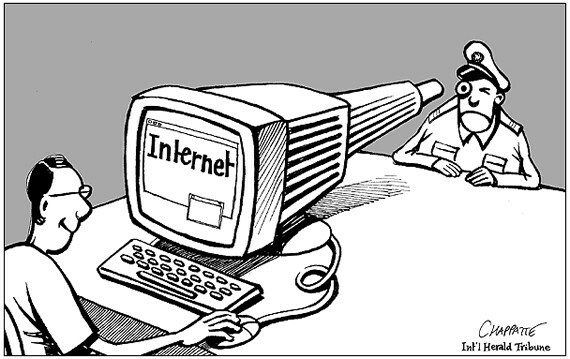 Once again the regulation of the Internet and collection of private data is in the UK news. According to the BBC, Home Secretary Teresa May is to outline a bill that will force firms to hand details to police regarding who was using a phone or computer at a particular time. Providers would have to keep data that links devices to users. In effect the Police want to know the IP address that the machine was allocated at any particular time, this is information that the companies currently do not keep as it is of no commercial value to them. This is not the first time the UK Government has tried to pass legislation however that would enable large scale surveillance of Internet use, but the previous bill was dropped when they realized that it would not pass. Some think (and say) that this new proposal will be the start of an attempt to re-frame the argument and push a re-worded proposal whose aim will be similar to the last attempt. My own opinion however is that this may all be a bit of a diversion, as the providers already have access to all of this and much more information and can do what they want with it. They are not democratically elected and so do not answer to the people. They are multinational, or probably more correctly sopra-national, and can realistically avoid national laws that may make life difficult for them. They can move operations, move storage facilities, change customer agreements, and do not have to justify their actions to anyone. The idea that the government should not have access to this information is well worth thinking about, but governments are under some obligation to the people that they represent. They get access to the information that the providers want to give them. It will not be possible for the police or any other state organization to use raw data as they do not have the personnel to carry out such work, so they will have to be provided with already worked data. Where and how this data is stored, how it will be processed, who will have access to it, what will be done with it in the future, how safe it is, what rights the users have, international law, privacy, responsibility, and any number of other issues you can think of should all be raised. Once more the flow of information is in the hands of the big boys. It might not be right to worry so much about what a government might do with our data but better to worry about the data that the providers themselves have. Governments are asking for information from companies that already have it, that is the problem. All of the above is of course my own opinion! This week I have had an article published in an international peer reviewed journal called Glocalism. The article is about food production, and reports on many of the arguments that I touched upon in my recent food series. The article, rather catchily entitled “Collective food Purchasing Networks in Italy as a Case Study of Responsible Innovation” by J. Hankins and C. Grasseni is free and can be downloaded here. It is slightly more of an academic article than my blog writing, is co-authored with anthropologist Cristina Grasseni, and reports our joint fieldwork looking at alternative food production networks in Italy and the USA. “The term “glocalism” identifies the momentous changes generated by globalization, changes which have resulted in a permanent intertwining of the global and the local dimensions. 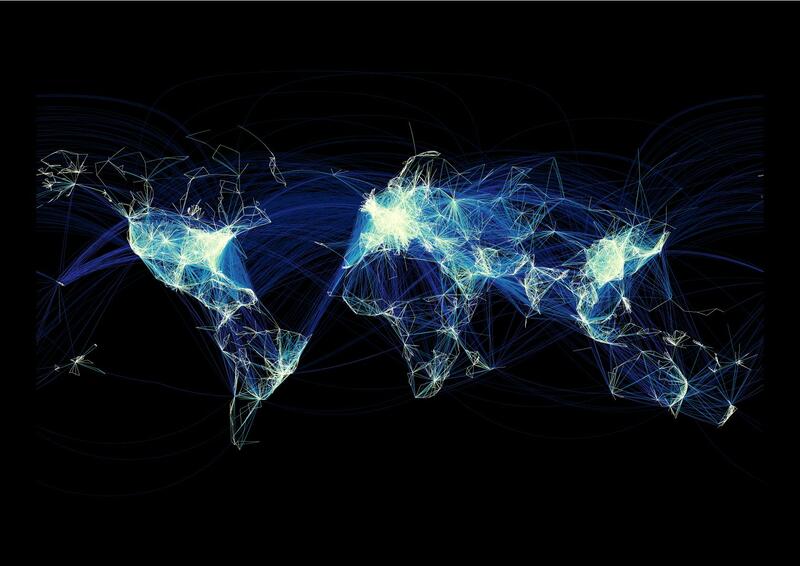 In fact, there is no longer any place on the planet which has not been touched to a growing degree by various types of global flows and, at the same time, there are no global flows which are not increasingly parsed according to the many different characteristics of the places”. Do you agree with this? That globalism means that the local can only exist in relation to the global? Or that globalization has effected every corner of the world? If we think about changes in the environment that maybe we should accept this line. If we think about how event in one part of the world effect others (or all) then we can see the local as part of a global system. If we look for local solutions to a problem are we in some way involving the global? If we are talking about anything that has to do with poverty, or pollution, or the environment, or anything related to technology, then we would probably have to accept that these are not local issues, but global. A house in Detroit is not sold for $1000 because of the state of Detroit, but because the world that Detroit is in has produced a situation that makes a house in Detroit (some areas) worth $1000. If we think about technology use through this framework, we can see how much the Internet (to give one example) is taking the local and moving it into the global. The proportion of our world’s population living in cities of a million or more has risen from thirty-seven percent in 1970 to fifty percent today. By 2030 more than two-thirds of world population will be in large cities, and most of them will be in Asia. Why is this? Well one reason is the need to operate via high speed Internet. The infrastructure is in the big cities, and it has become a necessary part of working life. So the fact that a city in India or Thailand has high speed Internet infrastructure effects mobility across the globe, the local and the global are entwined. This has an effect on food production capability, transport, the environment, and everything else you might like to think about across the globe. How about that for a thought on an autumn morning in front of the computer in the Netherlands or a wintry start to a New York day shovelling snow?